1. Universal design. 2. LED type: super flux piranha LED. 3. 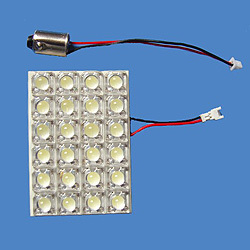 LED quantity: 24 pieces. 4. Size of PCB: 35 x 50mm. 5. Voltage: 12V DC. 6. Low power consumption: 2.13W. 7. Large beam angle: 120 to 140°. 8. Colors: red, green, blue, yellow and white. 9. High brightness: (1) Red: 36 to 48lm. (2) Green: 48 to 72lm. (3) Blue: 10 to 20lm. 10. Protection grade: IP44. 11. Easy DIY installation. 12. Long service lifespan: 50,000 hours. 13. Can be connected with T10, BA9S or SV8.5 wedge base. 14. Customized designs are welcome. 15. Applications: automotive inner decoration and illumination.